Delighted pupils at Swallowdale Primary School can now curl up with a good book in one of the borough’s most unusual spaces. That is thanks to a remarkable transformation that has taken place in their playground. A bus is now virtually unrecognisable from when it arrived at the school 15 months ago. It is now a shiny new reading bus set for many happy years of inspiring young minds. The outside of the bus has been brought to life with colourful graffiti of children’s book characters, including Paddington, Matilda, Horrid Henry, The Hungry Caterpillar and Where’s Wally. Inside, seats have made way for bean bags, soft pads and floor cushions, and up to £500-worth of new books have been purchased for the children to read. 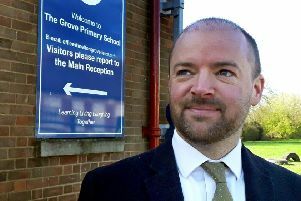 The project was the brainchild of assistant headteacher Gail Edwards. “When Swallowdale and Friends (SWAF), our school PTA, explained they wanted to get behind the project, a place to read for pleasure – not in a classroom or sitting at a desk was my first request. “Why a bus? Children love school trips and tend to view getting on the bus as a really positive experience – this also linked to the idea that books can take you anywhere – on a journey. We still have our school library, which remains just as important for the children to have access to books within school, but this area is also used for teaching because our school is growing each year. The bus was collected and delivered to the school in a pretty basic state in December 2017 – it only just fitted through the gates – and positioned on the playground. The winter weather put the first stage of the transformation on hold, but when spring arrived parent Steven Giles spent a huge amount of his own time renovating the inside of the bus with no cost to school. The driver’s seat and rear seat were retained, but everything else was stripped from the bus to create the largest space possible. The floor was levelled where required and a few leaky parts of windows were sealed. The school’s caretaker Mr Henshaw made sure the outside of the bus met all safety requirements before current co-chairs of SWAF, Mrs Hetherington and Mrs Sharp, cleaned inside, and the children outside. After painting done by Leicester graffiti artist Ricky Russel and carpeting completed by ‘Kiwi handyman’ Paul Barnett from Hathern, the bus was given the registration SWAF1. The final stage was deciding on the seating. The reading bus was officially opened on World Book Day by Mrs Edwards, before the excited children, staff, members of SWAF and supportive governors were finally shown on board by a Gruffalo. Mrs Edwards added: “I have a great passion for reading and always have done since childhood. I believe that encouraging children to read for pleasure, helping them to find books they connect with, laugh at, recognise themselves or others in, learn from, or escape into is one of the most important roles we as teachers play. “Every school day since the bus has been open groups and classes have been reading on it. One of the main questions from children has been can we take our shoes off? The answer is yes, and we are now looking into adding a shoe rack. “The buzz of excitement is wonderful. When I pass the children in school they tell me if they have been on the bus that day or talk to me about the book they are planning on reading aboard the bus.